I’m not going to add to the ink/electrons expended on the UK economic policy proposals emerging from the party conferences so far. Reading about them so far – and with more to come next week no doubt – sent me back to a couple of fascinating books I have on my shelves. One, published in 1958, is British Economic Policy Since the War by Andrew Shonfield. 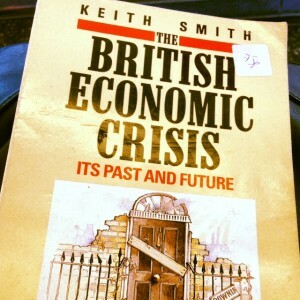 The other is a 1984 book with the superb title The British Economic Crisis: Its Past and Future by Keith Smith (as if the country had transitioned from having an economy to having a permanent economic crisis – well, it can feel like that). One of the dispiriting things is how much of the diagnosis seems relevant in successive generations. Obviously very much of its time, but many British readers now would feel a ping of recognition. Which crisis would that be? As others have pointed out – for example, Stumbling and Mumbling – UK business investment is weak, weak, weak. The balance of payments deficit was equivalent to 3.8% of GDP last year, the biggest gap since 1989. I’d like to see the policy debate acknowledge the long-term context. Bought the when it came out at the LSE bookshop. Grew up in a town with a lot of textile, engineering, shoe and light industry where also vacation work was done in several places. State planning did not touch any of these firms and the tax policies crippled the investment potential of their owners. Yet many of these could have been the firms of the future. Most of them just went gently down the drain over the next twenty years. On the railways where “investment” went we did get quite a lot of new steam locomotives. Then Beeching came along. Over in the West Midlands, however, the government were throwing money at the car industry. I recall a lot of traditional ships being built as investment, despite the fact that cargo was going into containers. Don’t mention Concorde and aviation please, this causes foaming at the mouth. Let me know what you think on re-reading! Crises? Nobody had crises in the medical field. Lots of work and demand for anyone there. Estoy feliz de encontrar blogs donde ver informacion tan necesaria como esta. Gracias por poner este post. …If the economic problems we have led to a technocratic government being installed in Britain (a bit like Monti in Italy) and you were given the chance to reshape British economic policy with the longish-term in view, what sort of changes would you make?